I gave myself permission to take a break near the end of 2013. To not post anything for a couple of weeks and to just take time and enjoy the time of year and to just reflect. I thought a lot about the changes that have occurred in me over the last year physically, emotionally, and spiritually. My physical changes are readily apparent for people to see. The changes to my emotions and my spirit are not so easy. I’ve written some about my emotions and how I am learning to manage them better and not react so quickly to a situation. It’s still ongoing and I’ll have more to say as I continue to grow in the process. Spiritually I’m a lot different too. As I’ve shared this whole lifestyle change/becoming healthy process has brought me a lot closer to Jesus. He’s done a lot of work in me and this and has awakened an intense desire to know Him more and more. I want to be aware of His presence every moment of the day. I’m acutely aware of how much He loves me and wants me to be the unique person He created me to be. So, what came out of all this reflecting? I don’t typically do any kind of New Year’s resolutions but what I decided was I wanted to have a specific desire or goal on my heart for the New Year; one that I would accomplish by leaning on God and trusting Him. What came out of my spirit and my heart was one word – Peace. I want peace in every area of my life. Now, I’m not naïve enough to think that everything will always be sunshine and rainbows. Who am I kidding? Trials, difficulties, frustrations, and just plain day-to-day life “stuff” happens to all of us and a lot of times there isn’t an ounce of peace in any part of it. 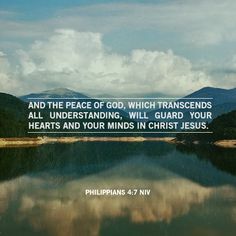 What I want when I say peace is to be able to cry out to Jesus for peace, knowing He will give me the ability to weather the situation with peace in my spirit. Will the specific situation go away just because I have a peace about it? Not necessarily. But it will allow me to be more of a Godly woman and deal with it the way Jesus tells us to. There have been way too many times that I’ve worried/fretted/stewed/harbored anger or bitterness or just about any other unhealthy or sinful emotion about a situation or a season I’m in. I believe all the emotions that I liked to carry around, all the unrest in my soul , all the stress I carried because I thought I had every right to feel that way, were not only unhealthy for me in my body, mind, and spirit but they were also sinful and grievous to God. So, my goal for this year, 2014, is peace. To be keenly aware of my emotions and before I “react” step back and asses the situation, even if only for a moment, and invite God to work in me and help me have peace to be able to handle the situation with Godly wisdom. So, how’s it gone so far? Let’s just say I will always be a work in progress. But, it’s going pretty good. I’ve already learned that sometimes when I don’t really know how or why I feel the way I do that I can just call out “Jesus” and this calms my spirit. I’m in a season right now where I need a lot of patience. I am waiting on God’s timing and I really want to “help” things along. I know that’s not how God works and I’m thankful that for the closed doors that have happened when I have tried to make things happen in my timing. A good friend of mine whose wisdom and insight I treasure has indicated to me that I am in this season for a specific reason and I know she’s right. God will reveal that as well. She also sent me something through Facebook that said to listen for God’s whisper. I like that. I think that may be how I think of peace a lot more. It’s God’s whisper to me/us and it is there just for the asking and the listening. The peace that passes all understanding. The God of Peace.